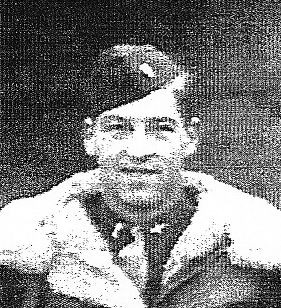 Geb Gebhard enlisted in the Army Air Corps in the summer of 1941. On March 10, 1943 he graduated from pilot training, was commissioned, and joined the 565th bomb squadron of the 389th bomb group as co-pilot of the B-24 “Sack Time Sally”. On August 1, 1943 he and his crew took part in the infamous low-level raid on the Ploesti oil fields in Romania. According to Geb, out of the 178 airplanes that took off that morning, only 33 were fit to fly a combat mission the next day. Geb and his crew were lucky to have survived without a scratch. Soon thereafter he became first pilot of the “Scorpion”, and experienced some adventurous missions. On a mission to Leghorn, Italy the plane ran out of fuel and Geb and his crew were forced to make an emergency landing on the island of Sardinia. They knew Germans were still on the island, but didn’t know where. Fortunately, the Germans were evacuating at that point into mainland Italy, and so they missed any unfortunate run-ins. Geb also witnessed a head-on German fighter attack at close quarters after his group bombed Ludwigshafen on January 7, 1944. He was flying deputy lead (just to the right and behind the leader of the formation) when he saw a German FW190 hit the lead ship “Trouble” from 12 o’clock high. The front of the plane exploded; all the forward crew were killed instantly. With the pilots dead, and a wing on fire, “Trouble” veered violently towards Geb’s plane, nearly taking Geb and his crew with it in its death spiral. Geb and his pilot were able to narrowly avoid “Trouble”, and continued on home, doubting anyone had survived. It was only 60 years later that Geb learned that gunner Robert Sweatt had survived the plane’s explosion, landed in France, evaded German soldiers for three months on the ground, and eventually made his way back to England. They got back into contact with each other after an article about Robert appeared in a 389th newsletter in 2004. Geb survived 25 missions over enemy territory, is a proud grandfather, and although sadly his first two wives passed away, he has been married for over 15 years to his third wife.